2017 has been quite the year for me. I left a fabulous team in Xbox at Microsoft, I became a father for the second time, I started a new role at Unity where I’m surrounded by smart people looking at solving hard problems, and I re-entered the world of Cryptocurrency after coming to terms with my earlier bitcoin losses. 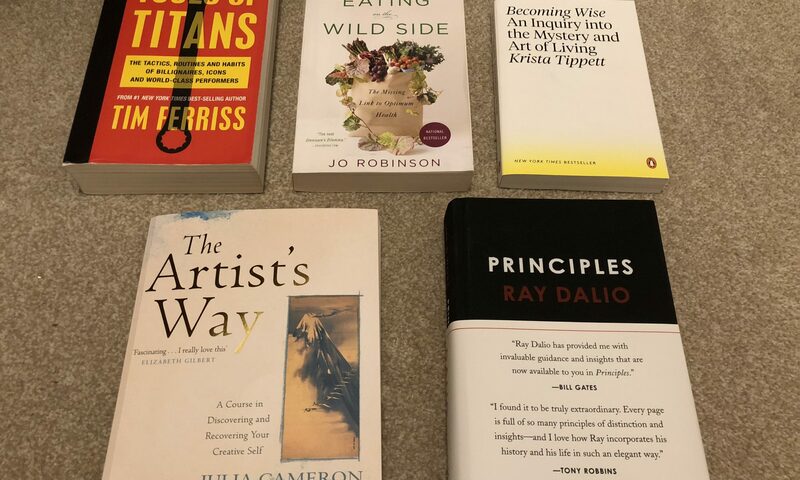 Tools of Titans – Tim Ferriss: A book I find hard to describe without tears of gratitude forming in the corner of my eyes. The wisdom, methods and inspiration for being more effective across all areas of life is incredible. This hasn’t only changed my life, I’ve seen people around me who’ve read it change also. Bit by bit Tim Ferriss is helping us change our lives and make the world a better place. Eating on the Wild Side: The Missing Link to Optimum Health – Jo Robinson: This book is incredible. Jo describes that over the course of four hundred generations, the human race has eliminated nutrients and replaced our once-wild fruits and vegetables with better-tasting, easy-to-harvest varieties, full of starch and sugar, and lacking the vitamins, minerals, and polyphenols of the original wild version. What I love is not just being educated to think more about this, it also contains how best to spot nutrient rich fruit and veg in the shops while at home how to retain those nutrients. Principles – Ray Dalio: After watching his excellent TED talk on how to build a company where the best ideas win, I was excited to learn about this book. I pre ordered and when it arrived got stuck in right away. It’s hard not to admire Dalio, he’s not just an investment manager, he’s a deep thinker whose philosophy extends beyond just his own life. His principles are designed for creating a good life and he has hundreds of them written down for that purpose. What I’ve found useful is his recommendation that people note their own so they can make better choices, I’m doing just that and can’t recommend this book highly enough. Becoming Wise: An inquiry into the Mystery and Art of living – Krista Tippett: A book I wish I’d had years ago. Reading it gave me a more hopeful vision of humanity along with my own personal growth to match. Krista focuses on the exhilaration of engagement with life for its own sake, not as a means to an end. After reflecting on this I realised I had greater strength and ability to meet the world where it really is, and help work at making it better. The Artists way – Julia Cameron: This book takes dedication and I’m not done with it yet. I first got wind of this from Brian Koppelman who recommended it to Tim Ferriss. Like many others I feel the tone and some of the content is not me, yet the idea of a morning brain dump (writing 3 pages each morning, aka morning pages) has stuck with me. I feel more creative again! For the last decade I’ve been stuck in a low creative mode and it’s not who I am, The artists way has helped me be me again, it can do the same for you.